A neuroma is a thickening of nerve tissue that may develop in various parts of the body. The most common neuroma in the foot is a Morton’s neuroma, which occurs between the third and fourth toes. It is sometimes referred to as an intermetatarsal neuroma. 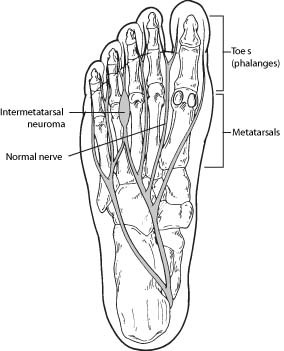 Intermetatarsal describes its location in the ball of the foot between the metatarsal bones. Neuromas may also occur in other locations in the foot. The thickening of the nerve that defines a neuroma is the result of compression and irritation of the nerve. This compression creates enlargement of the nerve, eventually leading to permanent nerve damage. Anything that causes compression or irritation of the nerve can lead to the development of a neuroma. One of the most common offenders is wearing shoes that have a tapered toe box or high-heeled shoes that cause the toes to be forced into the toe box. People with certain foot deformities—bunions, hammertoes, flatfeet or more flexible feet—are at higher risk for developing a neuroma. Other potential causes are activities that involve repetitive irritation to the ball of the foot, such as running or court sports. An injury or other type of trauma to the area may also lead to a neuroma. The symptoms begin gradually. At first, they occur only occasionally when wearing narrow-toed shoes or performing certain aggravating activities. The symptoms may go away temporarily by removing the shoe, massaging the foot or avoiding aggravating shoes or activities. Over time, the symptoms progressively worsen and may persist for several days or weeks. The best time to see your foot and ankle surgeon is early in the development of symptoms. Early diagnosis of a Morton’s neuroma greatly lessens the need for more invasive treatments and may help you avoid surgery. In developing a treatment plan, your foot and ankle surgeon will first determine how long you have had the neuroma and will evaluate its stage of development. Treatment approaches vary according to the severity of the problem. Padding. Padding techniques provide support for the metatarsal arch, thereby lessening the pressure on the nerve and decreasing the compression when walking. Icing. Placing an icepack on the affected area helps reduce swelling. Injection therapy. Treatment may include injections of cortisone, local anesthetics or other agents. Surgery may be considered in patients who have not responded adequately to nonsurgical treatments. Your foot and ankle surgeon will determine the approach that is best for your condition. The length of the recovery period will vary depending on the procedure performed. Regardless of whether you have undergone surgical or nonsurgical treatment, your surgeon will recommend long-term measures to help keep your symptoms from returning. These include appropriate footwear and modification of activities to reduce the repetitive pressure on the foot.